Is lack of secure bike parking discouraging new cyclists? Bike theft is a common problem; nearly half of all active cyclists have had their bike stolen. Cities across North America have adopted policies to promote cycling to take advantage of the many positive economic, health, environmental, and social benefits of active transportation. As a result, many cities have seen unprecedented growth in their bike mode-share. The rising popularity of urban cycling is good for individuals and cities, but it has also opened the door for large-scale bike theft. Bicycle theft frequently goes unnoticed – but that isn’t because it’s rare. According to research from the McGill University, nearly half of all active cyclists have had their bike stolen! Of that number, many have had their bike stolen multiple times, especially if they ride year-round. It often seems like there are bike thieves around every corner, but it doesn’t need to stay that way. Widespread adoption of secure bike parking and bike registration can make cycling safer. Despite the outrageous numbers, bike theft still tends to be overlooked by police and city management. The disconnect is so severe that many victims of bike theft don’t even bother to report it. Chronic lack of reporting and enforcement has encouraged thieves, making the problem steadily worse in cities where law enforcement practices haven’t kept pace with the shift to active transportation. Cyclists are four times more likely1 than car owners to be victims of vehicle theft, but car theft still receives much more attention from law enforcement. The discrepancy is primarily due to the relative cost of cars versus bikes, and the number of drivers versus cyclists. The low clearance rates are also a contributor – police officers aren’t always keen to prioritize a case that is unlikely to be cleared. This enforcement bias unintentionally favors the wealthy. People who can afford to own a car and pay for parking get their vehicle theft reports taken seriously by police, while those who cannot afford to drive, or who choose to live more economically, do not. The tendency to focus on high value thefts to the near-exclusion of bike theft encourages bike thieves and makes the problem worse. While bikes aren’t as expensive as motor-vehicles, they aren’t cheap either – a decent bike can run anywhere from a couple hundred through several thousand dollars. High-volume thieves view their work on a larger scale. While it may require multiple bike thefts to make as much money as a single car theft, bike thieves are much less likely to be caught. Even if they are caught, successful persecution is unlikely. There are a deluge of other crimes and social issues for law enforcement to manage with limited resources. Compared to other issues, bike theft can seem unimportant, but the data shows that there are plenty of reasons we should care. The other side of the problem is cyclists themselves. Many riders simply aren’t informed about proper bike security: they make basic errors like securing a single quick-release wheel, or locking only the frame. Of those who are informed, some just aren’t willing to sacrifice convenience for security. Despite knowing better, they may position their lock ineffectively to save time. Others are unwilling to pay for or bike farther to find secure bike parking. The result is a lot of easy targets. Even when bikes are locked, thieves can take parts of the bicycle. The forces of easy access and minimal risk combine to make bike theft the perfect crime – and it’s hurting cities badly. Bike theft has harmful economic and social consequences for millions of people. When viewed at the statistical level, it is clear that bicycle theft is a much larger problem than most people think. Multiple studies have shown that fear of bike theft discourages bicycle use. Seven percent of bike theft victims never replace their bike1 – each time a cyclist has their bike stolen, they are less likely to replace it. At the same time as urban centers are investing in bike lanes and public outreach to increase the bicycle commute mode share, thieves are unintentionally running a counter-campaign. Fear of theft is a detractor from cycling, using public transit, and even stopping to shop at businesses without adequate secure bike parking2. The negative effects of bike theft don’t stop after the initial theft – it leads to a series of trickle-down crimes, known as the crime multiplier effect2. Once a bike is stolen, it is illegally sold to a fence or posted for sale online. Theft victims who need a replacement quickly and on a budget often frequent the same community sales forums and second hand shops where these stolen bikes are offered for sale. At that point, they may buy a replacement bike at a discount, even if they know it looks suspicious. In some cases, victims of bike theft even feel justified in replacing their stolen bicycle by stealing someone else’s. How can we stop bike theft? Concealable – Once they are riding down the street, it is difficult to tell the difference between a bike owner and a bike thief, making bike theft a concealable crime even in very visible spaces. Removable – It is quick and easy to steal and ride away with an improperly locked bike. Available – Rising bike ownership creates both theft opportunities and demand for stolen bikes. Valuable – The average cost of a bike is $300 to $400, but some cost well over $1000. Enjoyable – Some thieves are thrill seekers who steal a bike simply because they want a joyride. Disposable – Bikes are a more desirable theft target when they are easy to sell. By addressing these drivers, we can curb the problem. It sounds simple, but it’s true: the moment bike theft is no longer low-risk, easy, or profitable, fewer people will steal bikes. This isn’t just a theory – it’s already been demonstrated in real world data. According to the McGill study, bikes valued between $150 and $500 are more likely to be stolen than bikes values over $500. More expensive bikes are less likely to be stolen because cyclists who invest more in their bikes are more willing to search out and/or pay for secure bike parking. This is an encouraging sign; it shows that when people value their bikes, they make them less removable, and there is a corresponding decrease in theft. Getting people to buy more expensive bikes isn’t the only way to prevent theft. With a combined effort of public education and investment in secure bike parking, we could decrease bike theft dramatically. The single most effective tool in discouraging bike theft is secure bike parking facilities. Truly secure bike parking requires a sturdy rack that offers 2-point contact for the bike frame. The rack should be embedded or surface mounted with tamper-proof bolts – if the rack is improperly mounted, a thief can simply remove the rack and take the bikes along with it. Parked bikes should have the rear wheel and frame secured to the rack with a U-lock. In high risk areas like subway stations and University campuses, it is a good idea to take extra precautions: remove valuable accessories, lock the front wheel, and park in a well-lit location. U-locks should be locked around both the frame of the bicycle and the wheel. Cable locks allow for locking both wheels and the frame together, so that they can’t be stolen. Secure the rear wheel and frame to a rack with a U-lock. 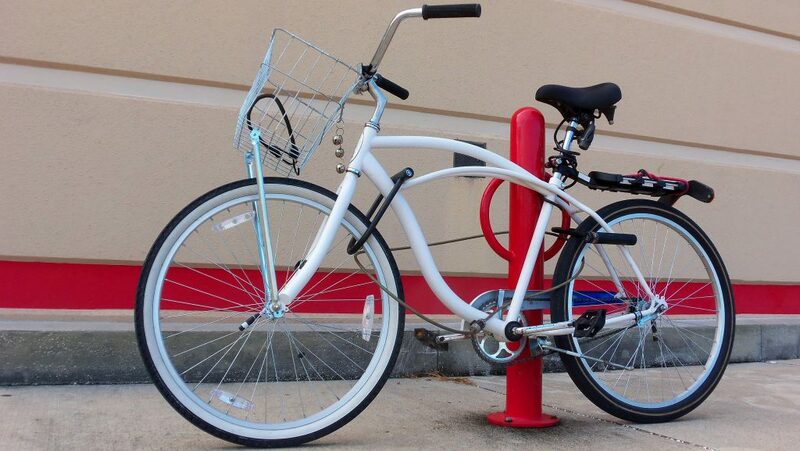 For extra security in high risk areas, secondary locks can secure the front wheel and seat. It is important not to get complacent. Bike thieves will always be on the lookout for the weak link – the lazy locker – on which to focus their efforts. Visit our bike parking guide for more information on secure bike parking. A properly secured bike is not removable or concealable. Even if a truly determined thief attempts to saw through or bend a U-lock, they will be unable to do so quickly or inconspicuously, especially without ruining the very bike parts they are trying to steal. Locking up is the best way to prevent theft, but it isn’t the only way. A major driver of bike theft is disposability. Unregistered bikes can quickly and easily be fenced to a second hand shop or sold online – even should the rightful owner find their own bike for sale, ownership is difficult to prove. Information sharing systems like the Bike Index provide a searchable database for registered bikes based on serial numbers and photos. It makes it easy for bike shops, second-hand buyers, and law enforcement to get information on a suspicious bike. If the bike has been stolen, the registry provides information on how to contact the rightful owners. When registration reaches a critical mass, bikes will become much less disposable, and thieves will be less motivated to steal them. In the meantime, it’s worth it to be an early adopter. Reducing bike theft has far reaching benefits beyond individual cyclists. Police will need to deal with fewer theft complaints, people will take more trips by bike, traffic will decrease, and vehicle parking will become more efficient in city centers! The first step in fighting bike theft is to spread the message. Encourage other cyclists to register their bike and take security precautions. Engage with city hall to demand adequate parking facilities. We can make cycling safer for everyone by working together. 2 Johnson, Shane D. et al. “Bicycle Theft”. Center for Problem-oriented policing.